“The Bitter Tea of General Yen” must be, in my opinion, one of the greatest films of the early 30s. I was very much impressed by the performance of Nils Asther, a Danish actor who is very little known today and who had a remarkable career in the silent era. He appeared in several movies with such fine actresses like Greta Garbo, Joan Crawford, Fay Wray, and Loretta Young. 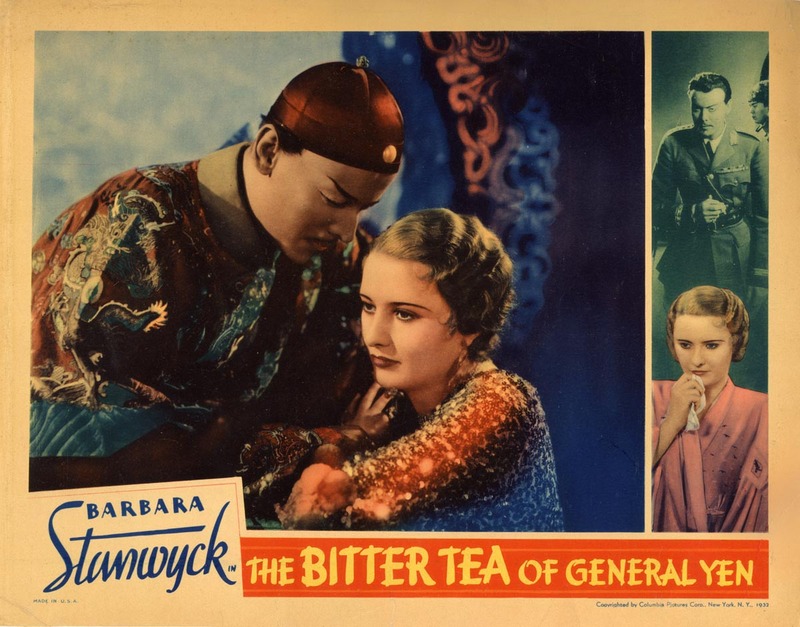 In “The Bitter Tea of General Yen”, his co-star was another great actress, Barbara Stanwyck, though I have to admit that Nils Asther is the one who simply steals the scene. I can’t think of anyone else better than him in the role of General Yen. This outstanding film reminds me of one of my favourites, “The Journey”, with Yul Brynner and Deborah Kerr. The story is quite similar. An officer or general, in this case, who falls desperately in love with a woman that he could never have completely, and in the end he loses everything because of this relationship. Both movies were made after homonymous novels. “The Bitter Tea of General Yen” is a book published by Grace Zaring Stone. She also wrote another great novel turned into a film, “Escape”, with Norma Shearer, Robert Taylor, and Conrad Veidt. The persona of the General in both movies is fascinating, but, of course, Nils Asther’s Chinese General is different from Conrad Veidt’s Nazi General. Still, they have the same powerful presence, which electrifies the audiences, and the same strong will in their performances. The same happens with Yul Brynner’s Major Surov in “The Journey”. If “The Bitter Tea of General Yen” had been remade, Yul Brynner would have been the perfect choice for the leading role. As for Barbara Stanwyck, she is good, but not memorable in the role of a Christian missionary who finds herself trapped in Shanghai during the Chinese Civil War from the late 20s. A better choice would have been, to me, Loretta Young, Fay Wray or Joan Crawford. I was surprised to read that “The Bitter Tea of General Yen” was a failure at the box-office, especially because of the relationship between a Chinaman and an American woman. This idea was rejected at its time by the audiences and by the film critics, but nowadays, this film is considered a superior production of the old Hollywood, and I perfectly agree with this. I liked very much this motion picture of the Columbia Studios, directed by the famous Frank Capra (best known for his screwball comedies), and I also liked the idea of turning the love scenes between the General and the American missionary into a dream. The ending is sad, just like in “The Journey”, but very significant. I recommend you to watch “The Bitter Tea of General Yen”. You will certainly like it very much. Esta película me encanta. Nils Asther fue un gran actor. La fotografía es hermosa, al mejor estilo expresionista. Es uno de mis filmes favoritos.